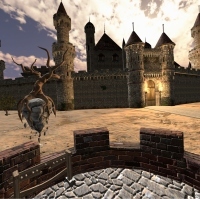 Defense of Castle Chilly is a Virtual Reality game written specifically with room-scaling in mind. If you live in Australia, you might considering attending Supanova - Brisbane, for the premier! For a VR game, the virtual world is quite large, and several stand out features will make Castle Chilly different to any other wave defender you've played . Skill and intuition are a must if you expect to stand in the way of the invading forces. The bow and arrow mechanics are far more involved than your average archery shooter - it's up to you to keep your quivers re-stocked, and to learn advantageous techniques like speed-loading, enchanting, as well as plenty of unadvertised tricks that I hope you get the pleasure of figuring out. In Defense of Castle Chilly, the invading forces goal is the castle gate, so in that way this is a defender game, but they're not exactly going to just let you stop them - so you'll also need to defend yourself at times as well, while still ensuring the castle itself remains safe! But wait! it takes time to mount an attack - while the enemy is busy regrouping, you are granted time to explore the inside of the Castle! find useful tools and upgrades to help you fight, discovering mystical rooms and unlocking the castles secrets along the way. The overall experience is Defense, Survival, and Discovery. 100% room-scale movement. Use your legs to walk around the entire play area, no 'blink'. 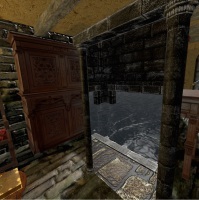 Walk through magic doorways (portals) to naturally move between rooms. Additionally: the environment changes to suit your available physical space, to match the virtual world space with your physical world space, to give you natural boundaries and hold immersion. Discovery. 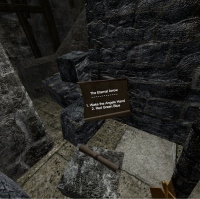 Explore the inside of the castle between attacks. Find new items, solve puzzles and figure out new techniques for fighting back the enemy hordes. The goblin army mounts their attacks in progressvely more difficult waves. There is time inbetween each wave for you to explore the interior of the castle to resupply, solve puzzles and explore. Items found within the castle may differ slightly each time you play. This mode allows you to skip the rest of the gameplay and go straight to a variation of the throne room scenario (this is when the castle has been breached, and it is your duty to protect the throne until your last breath). In 'Last Stand' there is no rest, and nowhere to run, just you standing between the throne and the invading forces. Kill as many as you can, survive as long as possible! You can have a buddy help you out with the keyboard/mouse or gamepad. The second player joins in as a small flying Fairy, capable of shooting magic bolts and casting spells designed specifically for assistance (The Fairy is a support character). Co-Op can be used on any game mode and any play style (ie: Endless/Last Stand/Campaign), just press 'A' on your gamepad or 'Ctrl' on the keyboard or click the mouse to tag in as the Fairy. Spells include healing, shielding, fireballs and the ability to remotely guide the players arrows! 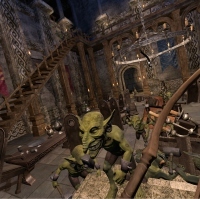 PC player gets the chance to battle AGAINST the VR player, by taking command of the goblin army! Will the VR player survive all waves? or will the Overlord prevail? As the PC player, you plan what comes out of the portal, issue strategic commands, upgrade the goblins, launch bombardments from your catapult, and use special overlord spells to enhance units and outwit your opponent.